Blakey Moor viewed from Northgate and looking down towards Nab Lane and the Technical School. 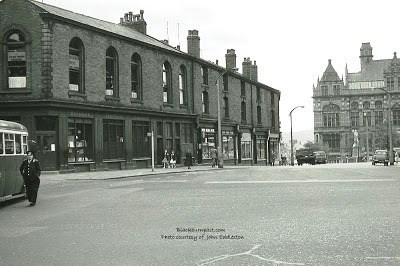 The Jubilee pub is just out of view, beyond that second lamp post, where the row of shops angles off to the left. Doesn't it look clutter free without today's traffic? Just in front of the bus was the Collector of Taxes office(>1967 - later Broseley House). Anybody calling in to pay their taxes had to negotiate my father's bicycle which he used to lean against the lobby wall - always ready to go out and catch someone who owed tax! He later used a BSA Batam 125cc motorbike that he parked up on the pavement by the side of the front of where the bus is!!! Looking for any photo of Blakey Street , my wife's granfather was born there in 1896. Sorry but I have no contact at all with John Eddleston, never have had. If you scan the internet, you'll find many of JE's images used without permission, so I doubt anyone would object to you using them. But please don't interpret that as me giving you the go ahead, I'm not in a position to do that. No-one ever granted me permission to use them, but no-one has ever complained about me having them on this blog either. I would take them down immediately if they did (as long as they could prove ownership). Any I use, I put John Eddleston's name on them, so as to ensure he receives the credit. Part of me wants to applaud what you are doing, with regards the GVNTH project and I wish you luck with your endeavours, but I also find it a little ironic, given that the borough council have spent the last 50 years destroying this town's heritage and the last 10 years destroying its nightlife. I think this John Eddleston photographer is an old friend of my dad, about same age as him in his late 80s now. We've watched together the Blackburn videos at YouTube that include some of his photos and I'm sure my dad has said he thinks he's his old mate Jack "Eggy". If so, he left Blackburn and emigrated - I think to Canada - but I will check this with my dad who is still here in Blackburn, if you like. He might still have contact address for Jack. In the late 1990's (1998 I think) when JE's collection of his 1960's slides first came to light, it was said he was in a retirement home in Southport. That's like 17 years ago now. No-one ever said how old he was at the time though. Thanks for all of the information on this - really helpful. The pictures on here have also been really useful in helping us to establish historical details that might be appropriate for any building refurbishments. Sorry for taking so long to get back to you on here. We are hoping to get our stage II Heritage Lottery Fund application in by the New Year and if all goes well we should be able to start in the summer which will be great news for the area. The Council does acknowledge the amount of heritage that has been lost in the town over the years in the name of 'progress' and this project is about trying to make sure that mistake isn’t made again and to ensure we can make the most of what we have left. It does however, sadden me greatly that there are still very recent examples of decisions being made to allow historic buildings to be lost, but I can assure you as individuals there are many officers within the Council that fight these decisions and work hard to secure funding or to build the cultural and economic case often needed to protect a building. Unfortunately, we are not always successful but the fight goes on. Sites like yours do make our job easier and I can say for certain the images of both Blakey Moor and Northgate have gone a long way to help persuade decision makers of the historic value of these buildings and their potential to be beautiful again. As for the night-life, well fingers crossed some improvements to the areas around King Georges Hall may help to revive some of this. Thanks for your help, Julia.